There is no one right way to apply blush, but there are some general guidelines you can follow to get the best contours for your face. Application of blush depends on the shape of your face. LONG: Apply blush on the apples and blend out towards the temple. 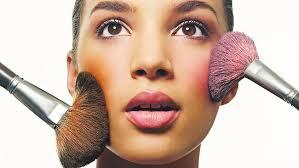 OVAL: Apply blush on the apples of the checks and blend in a circular shape with a blush brush. ROUND: Apply blush in an angular motion and blend from the apples upward towards the temples. SQUARE: Apply blush in a linear motion from the sides of your nose toward your ear center. All night staying power: apply cream blush as a base, then top with a similar shade in a powder blush. If you have dry skin or fines lines and wrinkles, try a cream blush. If your skin in oily, stick to a powder blush. Powder blush is better in warmer weather, cream blush is better for cold weather. Thank you for the info. Thanks to taking prednisone, I now have the dreaded "moon face". In other words...super duper round. Do you have, or know of a pictorial, that illustrates these? Thanks as always! Thank You so much for the tips! I never knew about the powder blush in warmer weather and cream blush is better in colder weather!